Main Deck seats are located within 15m from the stage, so you can really get involved in the action! Get closer to the action with the best seats in the house! NEW - A never before seen, access all areas backstage tour! Please print this and present it upon arrival at Pirates Mallorca to gain entry. Quarter Deck seats - the best in the house! Pick-ups are between 3.30pm and 4.30pm depending on where your hotel is located. East: Cala Bona, Cala Millor, Sa Coma, Calas and Cala Dor. Please note that you will need to contact the resort office upon arrival and provide them with a contact number for your time in Majorca; Unfortunately sometimes pick up times/place could change at short notice and we’ll need to contact you to advise your new arrangements and you might not be at your hotel (you might be busy enjoying the other attractions the island has to offer!). IMPORTANT: This ticket does not include entry to the Pirate’s Adventure Dinner Show. Available on selected dates between May and October. Pick-ups are between 3.30pm and 5.30pm, depending on where your hotel is located. Don’t Miss: Pirates Reloaded – for adults only! Jump on-board Majorca’s best-selling, most talked about attraction for the past 30 years! 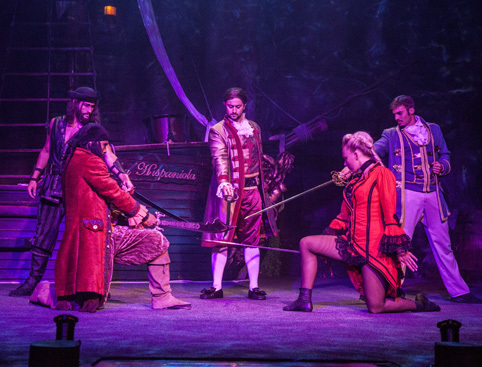 The unique, interactive Pirates Adventure Show in Majorca is a tale of high drama on the high seas, a swashbuckling, buccaneering show starring champion acrobats and gymnasts performing stunts and tricks, dazzling dance routines and classic comedy genius! 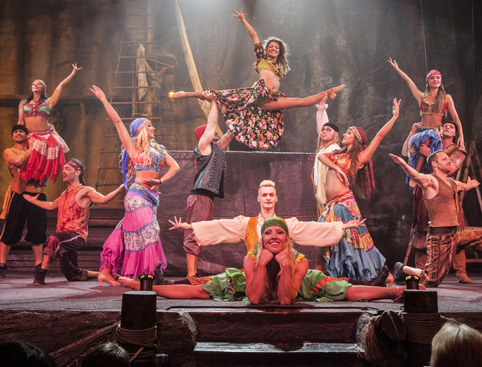 Pirates Adventure: Voted Mallorca’s No.1 Show! 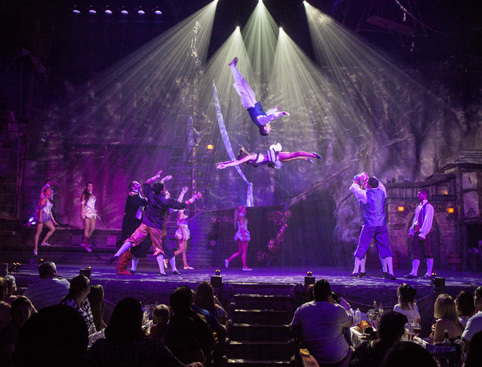 The family-friendly Pirates Adventure Dinner Show includes a hearty Pirates feast of chicken, sausage, potato wedges, coleslaw, bread and ice cream (vegetarian option available on request). Plus enjoy as much beer, sangria, soft drinks and mineral water as you can drink. Our selection of tickets include seating in different sections of the arena and complimentary extras. Main Deck: Seating in the Main Deck is no further than 15 metres from the stage, providing an intimate atmosphere that really involves you in the all the action. Quarterdeck: Includes Fast track entrance and the best seats in the house! Captain's Table - VIP: Do it in style! Your VIP treatment includes fast-track entrance, a hearty welcome in the VIP area, complimentary drink on arrival, VIP waiter service, souvenir ticket and lanyard and a signed souvenir poster for all children. From May to October transport is also available to the Pirates Adventure Dinner Show from various resorts across the island (on selected days only). 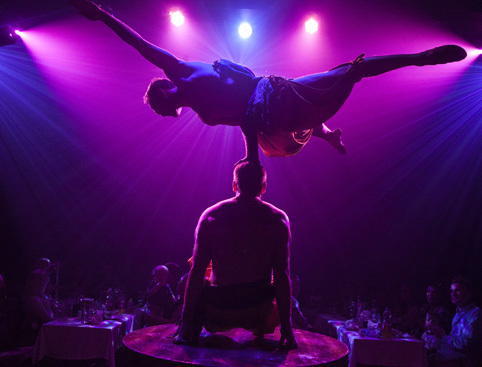 Simply select a transport add-on ticket for the same date you have booked to see the show. (Please ensure that you select the correct ticket for your resor)t.
Children under 2 years old can enjoy the show for free when sitting on an adult’s lap. Available on select date between May and October (for the 6pm showing only). Choose a Transport add-on ticket to include hotel transfers from various resorts across the island (selected days only) – Please ensure that you select the correct ticket for your resort. Transport from the East: Cala Bona, Cala Millor, Sa Coma, Calas de Mallorca and Cala Dor. Please call the number provided on your e-ticket to book your transport. Please note vegetarian meals need to be pre-order, please advise if vegetarian meal is required at the time of booking. Failure to do so will result in a supplement of 10€ per meal charged locally. We offer transport from the North, East and Southern areas of Majorca. 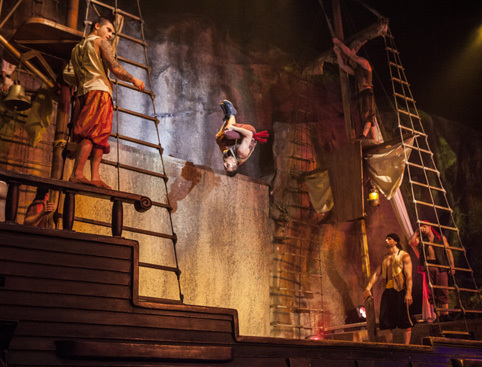 Pirates Adventure Show Majorca is rated 4.8 out of 5 by 15. Rated 4 out of 5 by toon toon rob from Great show, bit pricey. The show is great, we had quater deck seats table 105, the food was hot and decent quality, the beer was plentyfull and cold just keep asking, plenty sangria and bottles of soft drinks. we went at end of peak season, arrived about half hour before opening, small que to exchnge paper voucher for tickets then join a very hot que, be prepared for plenty hard sell of drinks and goody bags and upgrades in the que . Buy drinks for que on route as 4 cans costs 10 euros. after reading poor reviews we wernt sure but our experiance was great and well above our lowered expectations. Rated 5 out of 5 by blanchyfred from Perfect Family night out I was recommended this night out by friends and was initially not sure as teenage sons. However they loved it and it was a totally jaw dropping amazing performance. The actors are so friendly and allow photos at end and we left on a high. Rated 5 out of 5 by Mattyboy1972 from World class show Didn’t realise you could buy tickets from a UK site for this. Very pleased with price paid and would recommended to others. Need to provide an electronic voucher mind as had sleepless night worrying if email would come through and that I could find a printer to print off tickets! Rated 5 out of 5 by Nooooooooooooooo from Great night I was at the pirates night 30 years ago, it was amazing then, and still the same!!.. only thing that let the night down was the food!!! Rated 4 out of 5 by Susy from Nice evening out ! This show is an amazing thing to see and good value four Money. A show to watch for all ages. If there was any downfall of this night it has too be the dreadful seats. Tho we were booked up well in advance,expecting a good seat we were escorted to bass seats right at the back. The worst !! Rated 5 out of 5 by Cozza from It was Fab as usual We were there for my daughters hen do and had a fantastic night out. Would recommend this to anyone and special shout out to Lord Mellion who was superb. The only down side was that the meal was a bit disappointing compared to previous years. But still well worth it.